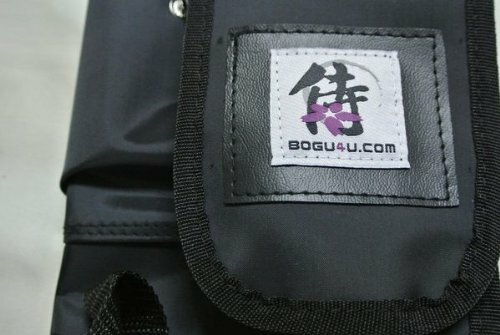 (B4-01)=Best Function= Made in Taiwan Deluxe Travel Kendo Shinai bag This is a very nice well design bag, can carry 4 shinai, and a bokken can put outside the bag. Made in Taiwan. Brand new with ensured quality and resonable price. Its Composition: 100% Nylon (70 Denier). Nylon's price and quality are twice more and smoother than ordinary shinai bag. 70 Denier Nylon is a lightweight lining material. This nylon fabric is typically used as a lining for jackets and quilting. This fabric may be used as a lining for bags as well. Warranty The warranty period for the Kendo Shinai bag is 90 days starts with the date when the product is received by purchaser. If any damage occurs before any usage of the Kendo Shinai bag, a new Kendo Shinai bag will be replaced without extra cost. If damage is occurred during the usage within the warranty period, customer can either choose to have FREE replacement with their next purchase or free replacement Kendo shinai bag with a shipping cost. For more details, please check on our warranty claim policy. If you have any question, please contact us by e-mail or leave us a question on the Q&A. Carry 4 Shinai, and A Bokken Can Put Outside the Bag. Composition: 100% Nylon (70 Denier). This Nylon Fabric Is Typically Used As A Lining for Jackets and Quilting. If you have any questions about this product by Bogu4u, contact us by completing and submitting the form below. If you are looking for a specif part number, please include it with your message.